I’ve made my second payment towards my student loan for 2016, and progress continues to be steady. I’m still pushing towards my goal to be student debt free by May of this year, and I’m still on track towards that goal. So far the winter has helped me keep my spending down, which results in more money going towards my student loans instead. Hopefully I’ll only be sharing three more of these student loan progress posts with you, which can then transition into savings progress posts instead. Those type of monthly updates sound much more appealing to me! I put $2300 towards my loan again this month, continuing the pace that I had started at back in January. I think my spending was a little higher in February, and while I haven’t fully reviewed the budget numbers yet I still think I can make it work. If I have to cut back on my student loan payment a bit in March, I can always do that. You can also see that my loan’s interest rate officially went up to 3.16%, a bit higher than was predicted last month. This is still significantly lower than my previous interest rate which was at 5.49%, plus I have already saved a ton of money by having my interest rate this low for several months now. That said, it does seem like interest rates are trending higher at this point in time. 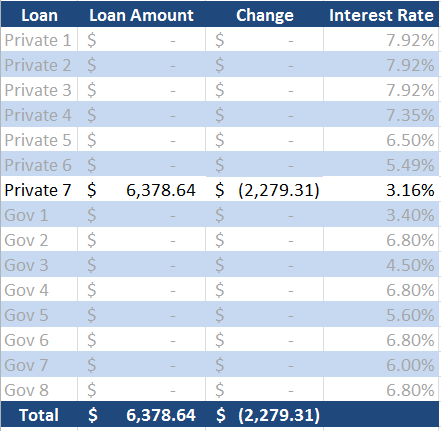 I probably would not have gone with a variable interest rate if it was going to take more than a year to pay this loan off. I’m also looking forward to receiving a tax refund this year, which would prevent me having to lower my payment. That is obviously dependent on me doing my taxes ahead of time though, but I have been gathering all the paperwork recently. I think this may be the first year that I will not be taking the full $2500 student loan interest deduction, so I will also have to see how that affects my return and the amount I receive back. Here’s to hoping that the next few months I am able to stay on schedule with my student loan payments, getting even closer to the finish line now! I hope everyone else is also off to a good start in 2016 towards their personal finance goals. Congratulations on being so close to paying off your student debt. I know how good that must feel since I too should be student loan free in May. I can’t wait for my last loan to be paid in full. I have been checking in on your blog from time to time since 2014 to see how you’re progressing. It helps keep me motivated. Thank you for following along, it feels good to know that sharing my story can help motivate others. I hope that you are able to reach your goal this year (and by May like I hope too) and I absolutely share in that feeling. Can’t wait to celebrate after making the final payment.